The RFP began as the Rosedale Community Youth Center in 2013 as a collaboration between students, parents, and educators in Rosedale. Inspired the successes of the 1960s Freedom Schools and of the Sunflower County Freedom Project, members of the Rosedale community came together to form an organization that could address the lack of opportunity that students face in this small town. In 2013, Jeremiah Smith, then a Teach for America corps member teaching English at West Bolivar High School, began meeting with parents at the Riverside Missionary Baptist Church, organized with the help of Ms. Gale Towers, Ms. Kisha Ivey, and other parents in Rosedale. Together, this group identified several issues facing students in Rosedale: a lack of exposure to new places and ideas, a lack of access to college prep, and an after-school environment that did not include many positive opportunities beyond sports. After looking at various programs throughout the Delta, the group decided that the model of the Sunflower County Freedom Project seemed most promising for the community, and soon after they began visiting and talking with the SCFP. In 2014, the RCYC partnered with WBHS teacher Jon Delperdang to bring students on trips to the National Civil Rights Museum and Brooks Museum of Art in Memphis, to the Mississippi River Marathon in Greenville, and to the Mark Twain National Forest. Meanwhile, the group discovered that the West Bolivar Christian Association, an organization originally founded by church leaders in Rosedale, had a building in Rosedale that was not being used. With the help of the WBCA board, the RCYC was able to move in and prepare for their first Freedom Summer. With the help of churches, local businesses, and fundraisers organized by Rosedale students, the RCYC was able to raise enough money to host its first Freedom Summer in 2015. Generous donations from the United Way of Cleveland-Bolivar County, JanTran, the City Council, and several families in Rosedale helped the RCYC to have an extremely successful summer program, with Fellows growing 1.5 years in reading, raising their scores by over 20% in math, and making huge gains in fitness and leadership development. As a result of these successes and following negotiations with the Freedom Project Network, the Rosedale Community Youth Center was given Freedom Project status in late 2015. The Rosedale Freedom Project resumed programming for Freedom Summer 2016, with its highest enrollment yet. Not only did the RFP work with more students, it also initiated a partnership with Freedom Summer Collegiate to provide high school Freedom Fellows with ACT prep and collegiate experiences. Following up on these developments, the RFP hosted programming throughout the school year, holding weekly photography and oral history classes. The RFP’s photography and oral history programming continued into the school year, as five Fellows partnered with Delta Arts Alliance in Cleveland to produce a 30-minute photo story on the history of education in Rosedale, and the history of inequality that African-american’s faced in a segregated school system in Mississippi. Fellows presented their photo story at the Grammy Museum in Cleveland, MS, as well as at the University of Illinois, Chicago. Freedom Summer 2017 maintained the momentum from the previous Summer and launched the RFP into its first year of full-scheduled after-school programming. Staff increased from one to three, and emphasis was placed on securing grants to ensure the future of the RFP. As part of these efforts, Lucas Rapisarda was awarded the Lee Fellowship through Leaders for Educational Equity and Jeremiah Smith was awarded a fellowship through the Voqal Foundation, which provided professional development, coaching opportunities, and a combined $80,000 in funds for the RFP. School-year program highlights included an expanded filmmaking program, creative writing club, homework help, novel studies, and the continuation of leadership club. Additionally, the RFP partnered with the Park School of Baltimore to have students complete Skype interviews with one another and then meet in Baltimore. As part of the Baltimore trip, Fellows traveled to Washington DC to speak to Mississippi representatives about educational inequity in Rosedale and presented a showcase of their films and poetry. 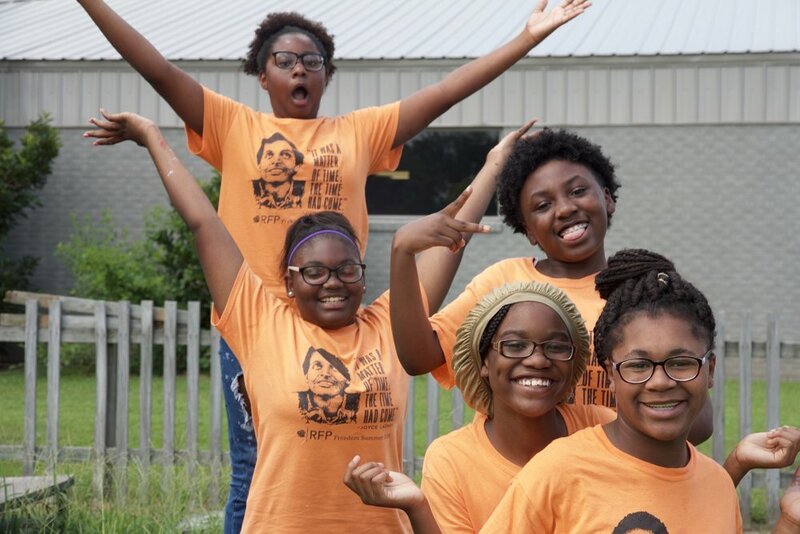 Freedom Summer 2018 built on the success of the school year, and greatly expanded existing programming. New developments included building two additional classrooms upstairs to accommodate growing numbers, creating separate 9th-grade sociology class, a culminating field trip to New Orleans for 8th and 9th graders, and a college immersion trip to Jackson State University. Beyond reading and math classes, Fellows had opportunities to take a yoga class, create visual art, work with professional filmmakers, and learn monologues and theater scenes. Our high school Fellows also had the opportunity to again receive college credit and complete ACT prep through Freedom Summer collegiate. The summer brought back many returning staff and Fellows, as well as a host of new faces. The 2018-19 school year promises to be the most active and busy yet. Among the most exciting of new RFP initiatives is the Youth Employment Program (YEP). The RFP hired 6 Fellows to work alongside staff to run creative programming, maintain the Freedom Farm, and organize logistics and fundraising efforts. YEP fellows also attended the Facing Race conference in Detroit, Michigan this fall, where they heard from national leaders of social justice movements. Beyond YEP, this Fall, RFP filmmakers worked with Blue Magnolia Films to produce several documentaries about important people in Rosedale, and a parent board was created to increase the voices of our families in the organization. This Spring, Fellows will again travel to Baltimore and DC, where they will meet with students, activists, organizations, and their government representatives. The RFP hopes to expand its staff team in the coming year and continue to expand programming in order to best serve Freedom Fellows and the Rosedale Community.